-- Please Choose an Option --	Short Length 43"-43 1/2" Long Length 54"-55"
Who is the fairest of them all? You, wearing this gracefully exquisite dress! A flattering, slimming, empire waist gives way to a perfectly modest pleated chiffon skirt. A tie neck and lace on the sleeves and bodice add feminine an vintage touches. You'll never feel more like a princess than you will wearing this chiffon and lace piece! Two lengths available. Made with Chiffon and Lace. Back Zipper Detail. Available in Tan and Black. Model in thumbnail image wears Dainty Jewell's size medium. I have had my eye on this dress for a while and took advantage of the recent sale and finally bought it! I am so glad I did! The dress is so beautiful! The fabric is light and flowey, and I just love the lace detail. I bought the black midi length and it fits me perfectly! I’m 5’6” and usually wear a size 8 and I got the large. 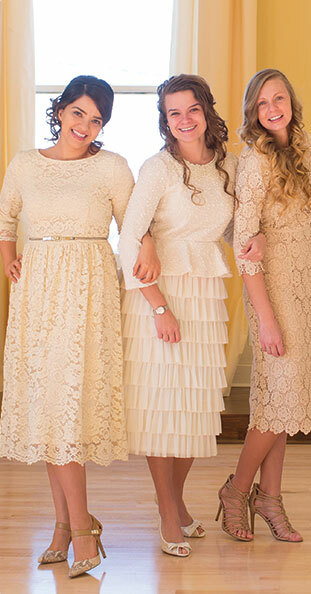 My daughter bought this dress at NAYC, and I have to say I think its very beautiful and lovely. She adores the color and lace two of her favorite things! All my purchases have been true to size (S) but for this dress she did have to size up! This dress is perfect in every way. The pleated skirt made it full and glamourous. Long but not too heavy for summer wear. Note: If you're questioning which size to order, I would order up as the chiffon has zero give. I'm excited to wear this dress on Easter! It's just what you'd expect from the photos. I ordered the long length and it touches the floor. Very elegant. This may be my favorite DJ dress yet! So elegant, modest and very easy to wear. Would love to see this available in other colors like blush, black, navy, etc. Fits true to their size chart.